Op verschillende media is te lezen over ons onderzoek naar “Tinder voor apen” in samenwerking met Apenheul. Waar komt dit idee vandaan? Wij (hoofdonderzoeker Mariska Kret en PhD student Evy van Berlo) zijn als onderzoekers geïnteresseerd in de evolutie van emoties en empathie in mens en dier. Het onderzoeken van dieren die evolutionair gezien het dichtst bij de mens staan is een van de manieren waarop we een kijkje kunnen nemen in het evolutionaire verleden van onze emoties en socialiteit. In Apenheul onderzoeken we twee zeer zeldzaam bestudeerde en zeer zeldzame mensapensoorten, de bonobo en orang-oetan. Samen met Apenheul en onze samenwerkingspartner gedragsbioloog Thomas Bionda zoeken we naast antwoorden op fundamentele vragen ook naar toepassingen van het onderzoek die ingezet kunnen worden voor het welzijn van de dieren die we bestuderen. Een van de uiteindelijke doelen van het project met de orang-oetans is een nieuwe matching methode te ontwikkelen, waarmee we door vergroot inzicht in de persoonlijke voorkeuren van de apen, beter kunnen voorspellen of ze in een nieuwe groep passen of niet. Dit helpt uiteindelijk om uitwisselingen tussen dierentuinen die nodig zijn om de zeldzame soorten voort te laten bestaan, soepeler te laten verlopen. Want zou het niet mooi zijn als er voorafgaand aan een verhuizing van een aap zou kunnen worden bekeken of dit individu een voorkeur heeft voor een bepaalde partner? Voordat we zover zijn, moeten er eerst een aantal stappen worden gezet en vragen worden beantwoord. Zo onderzoeken we dit jaar of orang-oetans net als bonobo’s aandacht hebben voor de emoties van soortgenoten. Daarnaast onderzoeken we door middel van een eyetracking studie bij de bonobo’s wat zij interessant vinden aan soortgenoten en hun sociale interacties. In de komende jaren breiden we dit onderzoek uit, en kunnen we samen met Apenheul tot een meer concretere methode komen. De “Tinder voor apen” kan dan realiteit worden! Lees ook Evy van Berlo’s Update van het project ‘Emoties in Apen’ . 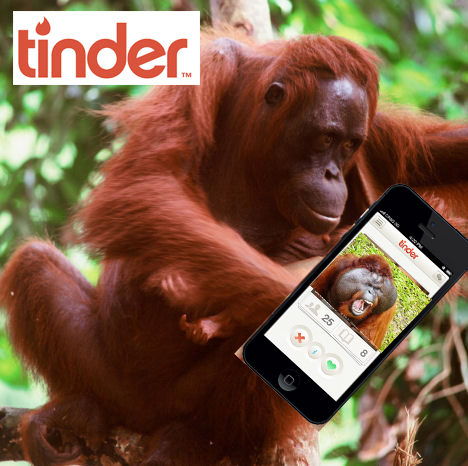 On many different media one can read about orangutans and tinder. I’d like to give you somewhat more background information about that project. Zoos are working hard to protect endangered ape species and they collaborate with each other to optimize breeding programs. So it’s often necessary to transfer individuals from one zoo to another. In the wild, orangutans don’t stay with their parents forever either. But these transfers often fail and it would be useful to develop a method with which you can predict the success of a transfer. The orangutan Tinder project has started just last week and is part of a bigger project where we study how great apes perceive the emotions of conspecifics. Together with the chimpanzee, the bonobo is our closest relative, so studying their emotional behavior and the differences and similarities with us, tells us something about the evolution of our own emotional behavior. My PhD student Evy van Berlo and I are fortunate to have the opportunity to collaborate with Thomas Bionda and colleagues from Apenheul primate park where we can study these species and we’ve already made some quite interesting observations so far. Two years ago, I started investing the bonobo, a very rare and understudied-species. What we did was we set bonobos behind a computer screen to look at pictures of other bonobos showing emotional or neutral behaviors. What we found was that just like humans, the attention of bonobos is immediately captured by the emotional pictures, and much less so by the neutral pictures. But in contrast to humans, their attention is mostly guided to the more positive scenes, scenes where bonobos were mating or where they were grooming each other. From an evolutionary perspective this makes sense. Bonobos evolved in a relatively safe and food-rich environment and they did not have to fight over sources like us, or like chimps. So for bonobos, it was much more relevant to keep track of who groomed whom or, you know, who did it with whom. This winter, we use eye-tracking equipment to not only study what kinds of behaviors capture immediate attention, but also where it stays and what bonobos are interested in to look at: a conspecific’s eyes, his or her behind, tools they might hold, etc. With thermal imaging measurements we investigate the subject’s level of arousal whilst viewing emotional images. And now this brings me to the orangutan, the only great ape species that lives semi-solitary and not in a social group. The orangutan has the longest childhood dependence on the mother of any animal in the world: the babies nurse until they are about six years old. The males generally remain solitary until they encounter a female who is receptive to mating. They will stay with this female for several days but will soon resume their solitary life. So it will be very interesting to investigate how orangutans, compared to other great apes and compared to us, respond to the emotions of conspecifics. Do they pay attention to conspecific’s emotions, do they empathize with them, do they mimic their expressions? And does it matter whether they are being confronted with a familiar individual, someone they know, versus someone they don’t? All these questions are on the research agenda and I’m thrilled to find their answers. My major interest is to gain fundamental insights into emotions and their expressions, where these behaviors come from and to study the similarities and differences between us and our ape cousins. But it will be wonderful if this research can be applied and used by zoos to make the transfers of individuals from one zoo to another more pleasurable by listening to the ape’s preferences. This is a long-term goal, and I am convinced it is feasible.